Lift Safe Ltd are the designer and manufacture of a wide selection of lockable secures cages or cage stores for storing valuable items, dangerous liquids etc. Lift Safe Direct provide high quality storage equipment and material handling solutions for all industries. All our storage cages are constructed from box section with strong welded mesh infill, come with a lockable storage cage door and mesh roof. Our unique flexible modular cage system means that our cages can be expanded at any time by adding more panels. 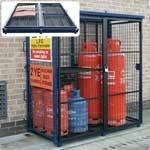 These cages can be fitted with cylinder securing brackets. 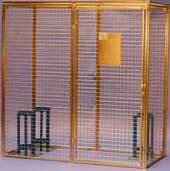 Our storage cages can also be used as a secure storage cage to protect your valuables. 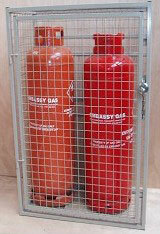 Fully enclosed cage for the storage or transport of 2 x 47kg propane/butane cylinders. 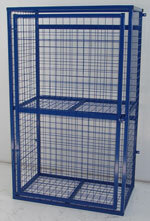 Constructed from fully welded box section with 10g mesh infill, this cage comes with lockable door and , wall and floor fixing points and is finished in a durable polymer powder coated finish. Fully enclosed cylinder cage for the storage of 4 x 12kg/15kg/ or 18kg propane/butane cylinders. Constructed from fully welded box section with 10g mesh infill with lockable door and rear hose and gauge access points, wall and floor fixing points and is finished in a durable polymer powder coated finish. 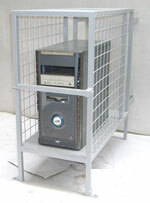 Unique folding cylinder storage cage design. Comes complete with health and safety signage. Holds 4 x 47kg propane cylinders and 8 x 19kg propane/butane, includes fold down shelf and ground fixings (If required). Constructed from strongbox section with 50 x 50 x 3.2mm infill, powder coated finish. cylinders O/A dimensions: H: 1650mm W: 1360mm D: 760mm. Weight 150kg. These cages are designed to protect your valuable equipment from theft; this is a standard cage with a polymer powder coated finish. (Standard silver grey RAL 9006) Liftsafe is a designer and manufacture of a wide selection storage cages if you do not see a cage that meets your requirements please contact us.